Bike Cleveland | Working For Safe Streets | Martin Luther King Jr. Dr.
Open Streets Cleveland comes to scenic Martin Luther King, Jr. Dr. between Parkgate Avenue and E. 105th St. on Sunday, July 29. Don’t miss a chance to bike, play, stroll, and dance along the boulevard. There’s 1.5 miles open for your personal car-free fun! Wondering the best way to get to Open Streets MLK? Whether by foot, bike, car, bus, or train, there are lots of options for you! ~Transit: RTA Bus 10 stops right at Open Streets Cleveland’s Lagoon Hub, and there are lots of other nearby connections from the HealthLine and Rapid. Visit www.riderta.com to plan your trip–a University Circle service map is here. ~Neighborhood Shuttles: Shuttles will be conducting neighborhood pick-ups from the Cleveland Public Library’s Langston Hughes branch (10200 Superior Ave.) and the Glenville Plaza (southwest corner of E. 105th & St. Clair) to the event at E. 105th and MLK Jr. Drive from 1:00-5:00pm. ~Parking: Thanks to the Louis Stokes Cleveland VA Medical Center for donating the use of their parking garage (1570 E. 105th Street) to Open Streets attendees! The garage is located on Magnolia Drive between East Blvd. and E. 105th Street, and is just a short walk to Open Streets. 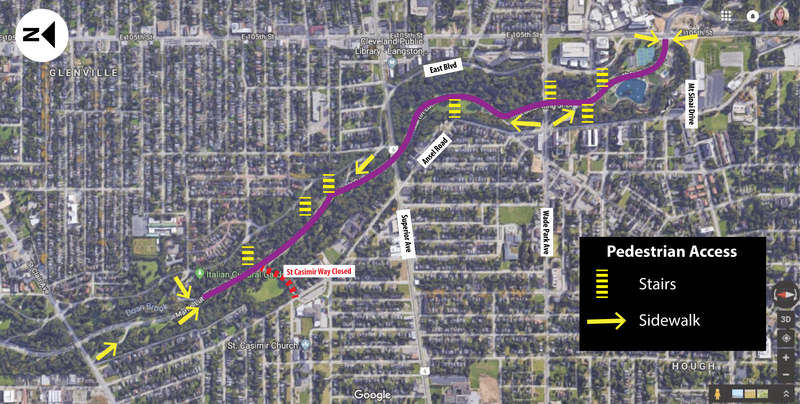 Follow posted hot pink detour signs for University Circle/Museums via St. Clair and E. 105th St. to avoid event traffic from Open Streets and the Italian Garden’s Opera Concert. 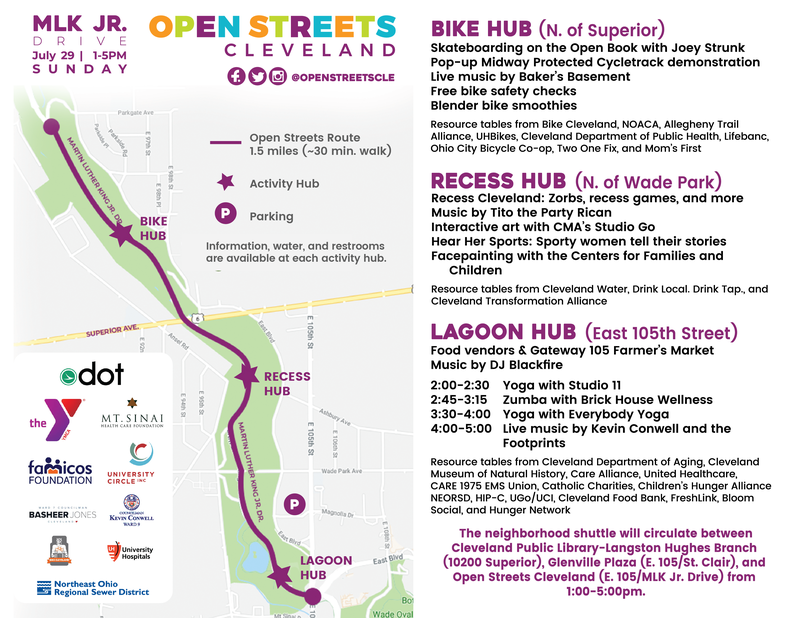 ~Pedestrian Access: There are multiple sidewalks and staircases leading down to Open Streets Cleveland on MLK Jr. Drive.